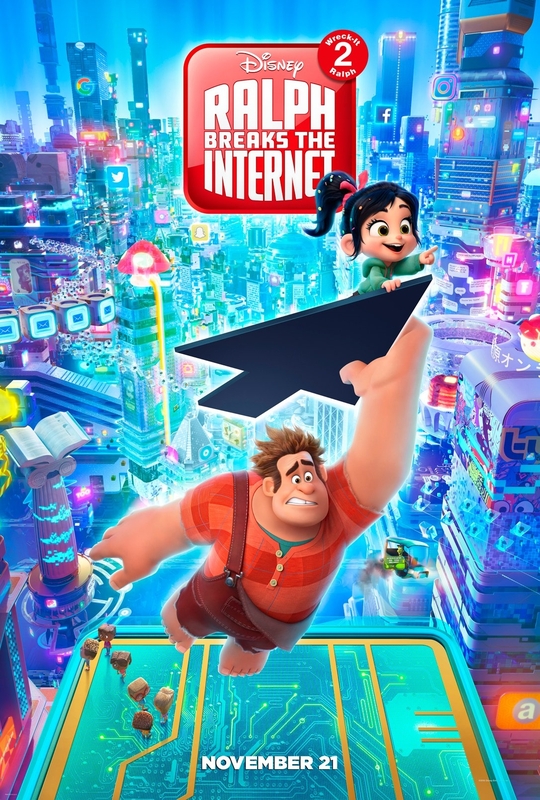 Ralph Breaks the Internet is the sequel to the popular Disney 2012 animated film Wreck-It Ralph. The first film about a video game character wanting to break out of his bad-guy mold charmed audiences and won over many fans. When Ralph Breaks the Internet was announced many wondered if it would have the charm and fun of the original. Thankfully, it does. 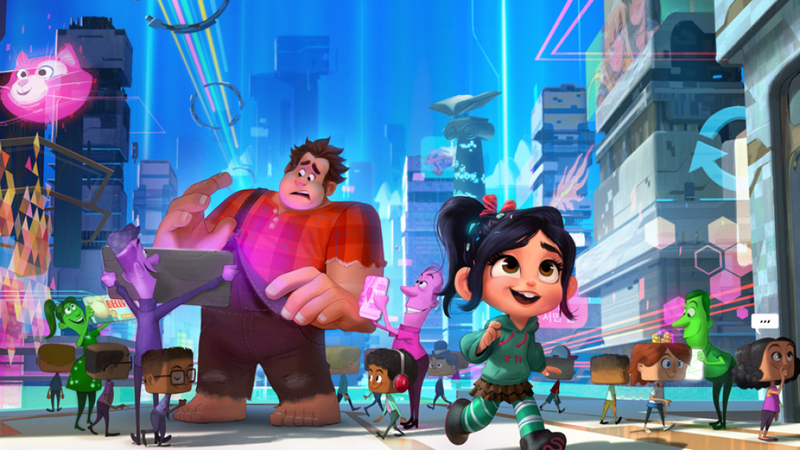 John C. Reilly and Sarah Silverman return to voice their roles of Wreck-It Ralph and Vanellope and the easy camaraderie between these two unlikely heroes is still there and is just as engaging. The creative team behind the sequel wisely knew what to keep and what to do differently. Instead of having another film taking place in the video game world, the boundaries were pushed and as the title suggests, the action mostly takes place in the expansive world of the Internet. Ralph and Vanellope venture out into this new virtual world in order to get a new part for Vanellope’s broken game console Sugar Rush or else the game will be permanently deleted. Their journey lets them to experience all the intricacies of the Internet including spam, online shopping, the Fortnite phenomenon and so on, to often hysterical results. There are many LOL moments in Ralph Breaks the Internet as they explore the Internet. One of them includes a visit to the realm of the Disney properties, which has been seen in the trailers. You would think that all the good moments would have been spoiled by the trailers, but there are tons more Easter eggs and references and cameos. Even though the Disney stuff may seem as gratuitous on the surface, they often serve the story, plus it manages to sneak in a nice Stan Lee cameo. And the segment with the Disney princesses is pure gold. But video game enthusiasts should note that this sequel continues to have nifty video game cameos. More often than not Ralph Breaks the Internet has many moments that will either bring out heartfelt guffaws or unexpected food for thought. The latter begins later in the film as the subject of friendship and how it changes over time is brought up. As with all friendships, Ralph and Vanellope’s friendship begins to evolve and this brings up conflict between the two. Vanellope wants something different with her life while Ralph is content with his situation. The film then takes the unusual step of having Ralph commit acts that are questionable and expose him as a flawed person. This was refreshing and honest since Ralph became more dimensional and conflicted within himself. It was a gamble for Disney to allow this unflattering development with its title hero, but it pays off. Even though Ralph feels insecure about his relationship, he is still a relatable character and has a great heart. Some may think this makes the film darker than the original Wreck-It Ralph but it enables the sequel to stand out and be its own film. Ralph Breaks the Internet is a cut above the standard animated sequel because it dared to explore not just new territory, but logical character development. Not to mention it is downright funnier than the original film and is just as emotionally heartfelt.